The easiest way to eat vegan. This is the moment; after months of tasting and tweaking, we can finally introduce our vegan recipe! We are happy to announce that our first batch of vegan powder will be banana flavoured. The biggest difference is that Queal Vegan won’t contain whey protein. Instead, we use pea and rice protein to provide you with the necessary protein requirements. Besides, one of our vitamin D resources was also derived from an animal resource so we changed the vitamin D source as well. Also, Queal Vegan will be lactose-free. Well… whey protein has a large influence when it comes to the flavour of the powder mixture. So until now, we weren’t enthusiastic about the taste of our vegan version yet. We’re going to sell a small amount – approx. the amount of two batches of Limited Editions – of the vegan bags first to see if you agree on the taste of the mix. When you guys think our vegan shake is absolutely fantastic, we’ll run a competition to decide what flavour should be next. WHY WOULD YOU EAT VEGAN QUEAL? The popularity of a vegan lifestyle is growing, but still, living a vegan lifestyle nowadays can be hard. Only a gradually growing amount of catering occasions or restaurants take vegan dishes into account. Having a shake by using vegan powder makes it the easiest way to eat animal-friendly! Vegan Queal, what’s in the name, doesn’t contain any ingredients retrieved from animal sources. Besides, like our ‘normal’ Queal, it’s a mix of sustainable and certified ingredients. Visit the product page to find out more about vegan, or go directly to the nutritional specs. Cool! Queal was my first powder and I had moved to other brands because of the lack of vegan option, so I'm definitely looking forward to trying this. Surprisingly, the ordering experience was pretty rough on mobile this time. I had to retry many times. The slider widgets on the shop page took ages to load, the checkout button was unresponsive, the order quantity did not correspond to the slider settings and my phone got pretty hot. I don't have this issue with other sites or Queal in 2016/2017. Browser: Nexus 5, Android 6, Chrome. The order widget (with sliders) was not very friendly towards older/slower mobile devices. On topic: We just received our production-batch of Vegan at the office. Gonna make my lunch with it right now! Is the non-vegan version of the Banana Mania flavour not available anymore? I really liked the taste, but I also like the whey protein, especially since the vegan version has much lower protein content. The normal versions of Banana Mania (Standard, Agile, Athletic) are still available, and they're not going anywhere! Still, is there a reason for the low protein content in the vegan version? Good question. We've done this mainly because we've come to the realisation that the protein content in Queal (Standard) is actually higher than we want it to be. Not that there is anything wrong with that, but our belief is that there weren't enough lipids (fat) in Queal. When (in time) we will update to Queal 5.0 we will also probably increase the amount of lipids. And shortly to illustrate that the amount of protein is still more than sufficient. An average person would need about 0.8g of protein per kg. Say this person weighs 80kg. Then the need would be 64g of protein. Or 21,3g per meal. 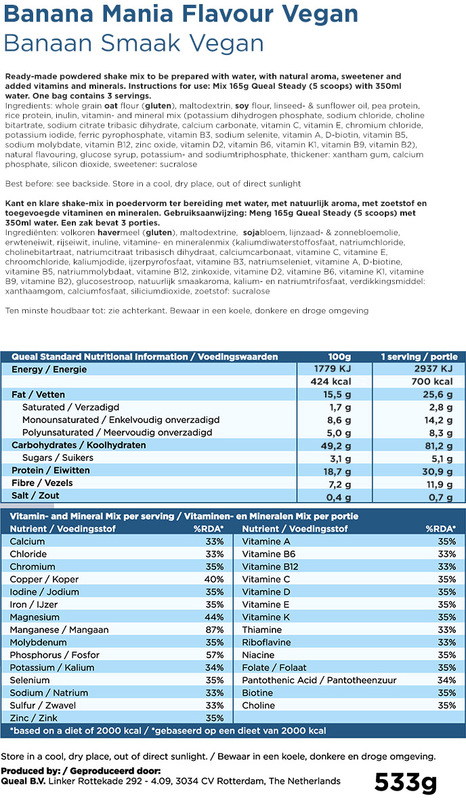 Queal Vegan has 30,9g per meal. That's good it has 30.9g of protein per meal. I've read that the body can only efficiently make use of around 30g at a time, although I don't know if this is true. As I workout though, I'd still need to add extra protein on top of Queal so reach my target of 158g/day (which is based on 0.82g x bodyweight in lbs). I also like the high protein content as it is now. If you're worried that the body cannot process all the protein it is always possible to take smaller meals very conveniently with Queal. Maybe you could consider keeping the high protein content in the Queal Athletic edition. One of the things that I liked about Queal, was that it wasn't vegan. You'll keep making the good batches with whey protein as well I hope? Been digesting 8 bags of the vegan banana flavor so far, and its been perfect! I feel bloated when i get dairy ingredients, so the vegan bags are perfect for me. Had no issues with it. Even feel more energized, i use BOOST with it in the morning. The taste is also very good compared to other brands making vegan meal replacement shakes. I'm so glad to hear you're enjoying it, and that it's fulfilling your needs! Yes, we're working on getting a nicer bag design for the Vegan, though it may take a bit of time to get fully sorted. I love it! It has a much better taste and structure then other vegan shakes I have tried. Minor downside: it has a slight artificial sweetener aftertaste. But I think that is almost unavoidable. Hope that new flavours are coming soon! My husband has had all the non-vegan flavours and I was so jealous of him. Had my first meal of queal vegan today and was very pleasantly surprised. I think it tastes a lot better than regular queal, as it doesn't have the weird "cheesy" aftertaste from the whey. I also like the idea of not supporting the animal industry. I will definitely continue ordering it. Banana is ok, but I'm hoping for more flavours in the future. i doubt that there are only yours top 3 wishilist for vegan flavours. at least, they are mine too. but macchiato on the third place with hazelnut on the first. Is the BOOST product considered vegan? Yes, the Boost is vegan!